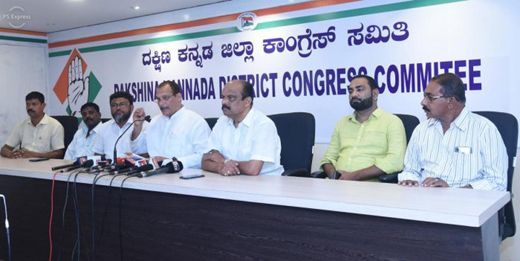 Mangaluru, Mar 27, 2019: MLC Ivan D’Souza said that with an aim of developing the district, the Congress-JD(S) coalition will bring out a separate manifesto for Dakshina Kannada for the Lok Sabha elections within two days. D’Souza, who is parliamentary secretary to the chief minister, was addressing reporters on Tuesday. “The issues on granting a separate railway division for Mangaluru, development of ports, withdrawal of the decision to privatise the Mangaluru International Port, setting of an IIT, retaining the name of Vijaya Bank, rehabilitation of beedi workers, and providing employment to the local youth will be included in the manifesto,” listed out the legislator. “All the promises will be fulfilled if the Congress – JD(S) coalition candidate Mithun Rai wins the upcoming Lok Sabha election,” D’Souza added. “After the Congress decided to field Mithun Rai as its candidate, a new wave has been created in the district. The wave will be retained till the end to convert it into votes during the election,” D’Souza said. “In spite of being an inactive MP, Nalin Kumar Kateel roams around the district wearing the peta of a Chowkidar. In reality, the constituency did not have any MP for the last 10 years. By working for the victory of Mithun Rai, we will fill the vacancy of an active MP,” he promised. “Prime Minister had promised to deposit Rs 15 lakh to the accounts of the poor by bringing back the stashed black money from banks in foreign countries. He has, however, cheated the poor by failing to fulfil the promise,” the MLC criticised. “If the Congress is voted to power, then it has decided to give Rs 6,000 a month to the poor. A Nyunatam Aay Yojana (NYAY) will benefit 15 crore population of the country,” he declared. “Modi, who had projected himself as a ‘Chaiwala’ five years ago, has begun calling himself a ‘Chowkidar’. It is merely a conspiracy to woo the voters. How can a Chaiwala become a Chowkidar?” the MLC asked.